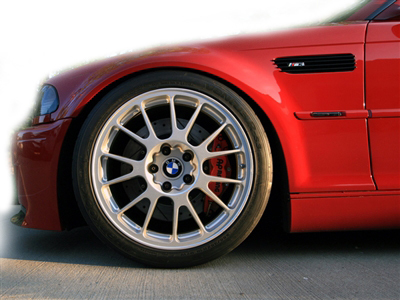 *Gloss Black Fender Grilles for 1999-2006 BMW E46 M3 BM-0074-GB Call 714-582-3330! - Set yourself apart from the crowd without breaking your budget! -These gloss black fender grilles will give your car more of a track look, without compromising its simplicity and classiness that you love. -Complete your "black out" look- these look especially good with blacked out taillights. Our gloss black side grilles for the E46 M3 are the perfect addition to your BMW and will add a unique and classy look to the exterior of your car. Our grilles especially compliment your vehicle if you have blacked out taillights and/or emblems. These grills will give your car a sleek, yet aggressive look, and add a beautiful contrast to your car's paint color. 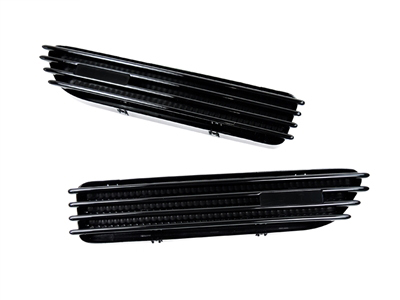 This product is a direct OEM replacement and of course they are a huge improvement over your OE grilles. They go through rigorous tests and quality control, are made from ABS for long use, Are NOT painted over chrome, and are top of the line quality.